UPDATE: The new version of the job aid is available for download from this big action mapping graphic. 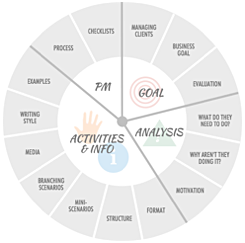 Use the job aid with your client and subject matter expert to show them the process at a glance, from the initial analysis of the problem to the rollout of the solutions. The job aid is a draft. Help me improve it! Please comment on this post with any suggestions you have, or send me a private message. Goal template: You’ll find the template and some tips in my post How to create a training goal in two quick steps. Problem analysis flowchart: You can download it and see how to use it in my post Is training really the answer? Ask the flowchart. I’m working on an activity-design planner that will help you ask your SME the most useful questions so you can design realistic challenges. I’m also working on a template you can use for a project outline, which could replace the traditional and often rigid design document. I’m hoping to release these with the book, and when they’re ready I’ll be sure to announce them in the blog. What do you think? What would make the job aid more useful for you? There are still seats available in the November session of my hands-on scenario design course. The courses usually sell out, so you might want to register now if you can. If it were me, I’d change ‘Write the measurable goal of the project’ to ‘Write the goal of the project’. For me, goals aren’t always measurable, there are indicators that suggest that they have been achieved, but it’s more the case of completing objectives to achieve a goal. Hi Andy, thanks for your feedback. The flowchart referred to in the job aid is the one that’s linked in the blog post, which has people look at problems through four filters: knowledge, skills, environment, and motivation. I think that motivation (what you might be seeing as attitude) is often strongly influenced by problems in the environment, such as cultural issues in the organization or poor leadership. So if someone on the team says “They have a bad attitude, that’s why they won’t do it,” I have them look again at the factors in the environment that might affect that attitude. These factors include everything from leaders not communicating the importance of the task to simply hiring the wrong person for the task. Unfortunately, it’s hard for me to see how to fit this much information into the one step on the job aid; the idea is that they would use the flowchart, which has them do that analysis in depth. For me, KASA are four areas of learning and are internal, yes I would include motivation in attitude, but attitude would for me, go beyond motivation. My most recent application of this tool is in areas that require user adoption and organizational readiness for a change effort. The taxonomy is useful for providing quantifiable behavior measures for what one would expect to be strictly internal states. Don’s chart is just a summary, but I have used more detailed treatments of the taxonomy to good effect in documenting progress in intangibles such as compliance and diversity. One example is in the pharmaceutical industry where CGMP needs to be practiced at the level of an internalized value that characterizes the employee. We are able to track learner progress as they move from awareness to practicing CGMP actions even when they are outside the workplace. This demonstrates that they have internalized the value set. And yes, it does happen. Even more importantly, it is easier to measure than one would think. Thank you for the continuous effort of getting the world rid of boring training! Great job mapping your methodology. I think it makes sense to specify if the goal in step one is the business goal of the project or the employee performance goal for the project. Based on the other steps I believe the first step should read something like ‘Write a measurable employee performance goal for the project. This will help discriminate from goals of the project such as training material deliverables or business goals such as improved sales. Thanks for that, Cathy. This might not be the best blog post to ask under, but older, more relevant ones are closed to comments. I’m planning to use action mapping for the first time next week (hooray! ), in relation to a request for sexual harassment prevention training. I already know that the client wants certain behaviours to stop and will find out what they are. So, in getting specific about what the behaviours needed, it’s more about stopping behavious, than what the employees need to do. Then the question becomes, why are they doing the unacceptable behaviours? Is that right? It will be awkward to ask people WHY they are touching others inappropriately etc (!) And then, how to assist them to get those behaviours to stop. Jenny, thanks for your comment. As you’ve pointed out, applying action mapping to a list of “don’t do this” behaviors is a little mind-bending. I agree your first step is to ask what are the behaviors that have to stop, and the next step is the uncomfortable one of asking why these behaviors are seen as acceptable by at least some people in that workplace. Ideally, you’d be able to talk to people who have done the unwanted things to find out why they thought it was okay. They might still think it was okay, in fact, and that they’ve been unfairly treated, so if you approach them with an open mind they could be happy to talk. If it’s not possible or advisable to talk to the people who have been “caught,” then your SME or client might be able to tell you what people said when they defended their behavior. If the audience is large and the problem is widespread, a survey might be useful, such as one that lists many common “grey-area” statements and behaviors and asks people to anonymously put them on a range from fine to unacceptable. This could highlight common trends in thinking and show where the “acceptable” line is for many employees compared to where it is for the employer. The least useful but probably most common approach is to have someone guess what people are thinking when they cross the line of acceptable behavior. You could look for research online about common beliefs or cultural issues that might be affecting the client’s workplace. When you understand the thinking behind the missteps, you’ll have fodder for subtle scenarios. Unfortunately, they’ll need to be very subtle if they’re included in a course that’s titled something like “Anti-harassment training.” One option is to include the scenarios with other materials that don’t have to do specifically with harassment, such as part of onboarding or in some “How to be a manager” materials. Then they’ll stick out less and people will be more likely to make the kinds of mistakes they need to learn from, such as hugging the intern who’s crying because her boss yelled at her. Thanks, Cathy. That’s given me something to think about. We do a lot of compliance training too, around workplace behaviours, and of course that means training people who aren’t necessarily NOT doing what their employer wants them to do…it’s just to cover the employer’s legal requirements and pick up a few who behave inappropriately. I really see how scenario-based e-learning can allow those who know the content to work through it quickly and not make them laboriously go through a program for those that don’t. 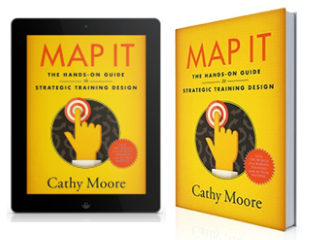 Hi Cathy – great tool, thanks for sharing and opening it up to feedback. From a constructive perspective, I’d change the icon you use to indicate ‘key deliverable’ to a key; I didn’t really make the connection of an upward pointing finger as a ‘key deliverable’ (in fact describing the icon in words sounds worse LOL)! From a finicky ‘no one else but me would care’ perspective I’d also change the grey shading that represents ‘decide strategy’ & ‘be interviewed’ to a lighter shade (if restricted to b&w) or a colour – however this is because I use grey shading to indicate something is either out of scope or to be ignored. It’s a personal customisation that does not reflect the quality of your document. With reference to whether a goal is measurable or not….. I was trained and have experienced the truth of this key principle in instructional design – if the Learning Outcome – the desired skills, knowledge, attitude, environment, motivation and/ or whatever needs to change are not documented in measurable language prior to designing the training (assuming that is the appropriate solution! ), it can’t be managed. If it can’t be managed it is extremely unlikely that anything will change. Working at GE emphasised this principle to me on virtually a daily basis – I believe it was a large factor in the success of their managers to actually ‘manage’ employees. Also, I agree that the first three steps on your document are critical to identify if training is actually the answer at all. If the behaviours displayed and the attitudes prevalent are a direct result of the orgnaisation’s culture and / or the working environment, focus needs to be placed elsewhere to find a solution. Thank you for your posts and tools. I find them to be useful reinforcement of ID and L&D best practice. Hi Josephine, thanks for your feedback on the workflow. The pointing hand that you see must be a platform-dependent issue; on my Mac it’s a star. This suggests that I can’t rely on Word to maintain its “special characters” across platforms, so I’ll replace the image with an actual PNG that won’t get changed. I agree that if the business goal isn’t measurable, little in the project can be managed or, in my opinion, defended. Thanks for your thoughts! Really like the job aid. Just wondering where audience profiling or finding out more about your target audience comes into your workflow and how important you think it is to do? 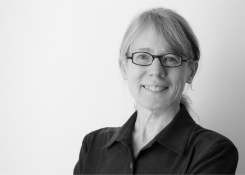 Hi Kate, the audience analysis is part of the steps in which we ask, “What do they need to do,” “Why aren’t they doing it,” and “Will training help?” When we look at who’s supposed to do what and when, we learn about who’s in the job, what challenges they face, what might be affecting their motivation, etc. During the activity brainstorming phase it can be helpful to create a persona, which is the profile of a typical real or composite person who will be using the materials. We can imagine that person using what we create. I also strongly encourage designers to test prototypes on real-life learners before developing the final versions. First, I have to say that I love the action mapping process and your ideas about learning outcomes/actions (Moore, 2009). I have been working with my team on writing better actionable objectives for the past three years based on your blogs and have seen a tremendous positive change in the focus of the training solutions we provide for our internal client groups. 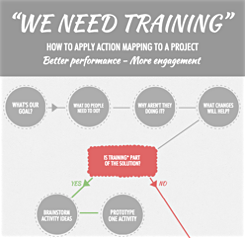 I have a question on the use of the team workflow for action mapping, specifically the produce activities/prototypes section. My team is often working on training solutions under the gun with tight deadlines. I have used ideas from Piskurich’s Rapid Instructional Design: Learning ID Fast and Right with my team to help with aspects of rapid design. You recommend developing activities in small batches. I understand the value of this approach as it allows for feedback and course correction, if necessary and in the end can save wasting time. My problem is that because of the tight turnaround time, we rarely have the time to take clients through a process as you have outlined in action mapping. We are usually delivering entire solutions with no time for the small batch approach. What suggestions do you have for working with our client groups using your tool in this type of environment? Can we combine or skip steps if necessary and what would these be? Thank you for considering my questions. Colleen, thanks for your question. As you’ve noticed, your main problem is the expectation that your job is to produce content on a tight deadline. It’s a cultural problem. Apparently the client’s expectation is that your job is to create what they want on the schedule they set up, usually using a waterfall process that allows for no real changes. This common approach doesn’t allow for the kind of needs analysis or consultative conversations that will open the door to more agile design. Unfortunately, there’s no quick fix. I usually recommend that freelancers in this position change their marketing to position themselves as problem-solvers and question-askers, not just producers, so they attract the kinds of clients who are willing to analyze the problem and consider multiple ways of solving it, including more agile activity design with changes in direction if necessary. If you’re not a freelancer and can’t change your job description, you could try encouraging the client to do their own analysis before they drop off content for you to produce. That way at least you might end up producing less content, which can give you wiggle room with deadlines so you can create activities in batches and change directions if necessary. Scenario mistakes to avoid #2: "Eat! Eat! You need to eat!"